This is no longer a Wetherspoons. It is open but under different management. Haven''t been in yet to have a look, but I believe real ale is still sold. 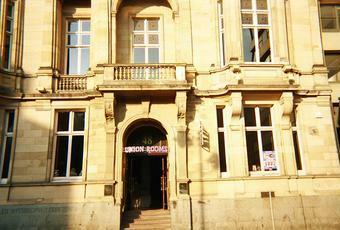 The Union Rooms is one of a couple of large Wetherspoons located just across from Newcastle Central station. It is surprising to have two so close together. But I heard that the Union Rooms may soon be closing. The other pub is the Mile Castle, which I will request to be added. 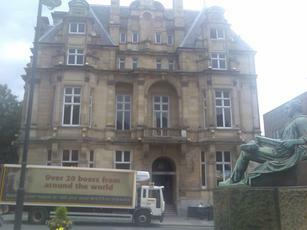 The Union Rooms is a fairly grand building though. The upstairs was closed for a private party, which was just as well as I saw a couple of people getting lost in the maze of rooms downstairs alone. The interior echoes a fair amount. So it does quite noisy in here. For the full selection of ales, you are best checking both the main bar at the front and the smaller bar at the rear. Although on this occasion, the ale selection was poor - just the usual Wetherspoons staples - Greene King Abbot, Ruddles Best & Sharps Doom Bar, supplemented by Ringwood Boon Doggle. Two ciders could be found at the rear bar - Westons Old Rosie & Gwynt y Ddraig Black Dragon. Whilst the Union Rooms is the more impressive building, you're likely to find a better selection of ales in the massive Mile Castle just up the street. Wetherspoons in a magnificent building that is just across the road from the station. It used to be easy to find, but now seems to have been swamped by the building site next door which is a “student hotel”. Only went in because I had a few minutes before my train. The main bar had a very uninspiring choice of (six) real ales. Then I saw a sign pointing to the “back bar”. Thought it worth investigating, and lo and behold there were 4 handpumps there as well – all from the Allendale brewery. It being 4pm on a Saturday, the place was heaving with shot-drinkers, and service was very slow. When I finally did get served (I chose the Wolf), it turned out to be VERY cold and had an unpleasant taste. I gave up the unequal struggle halfway through ! 4/10 – nice building shame about the pub. An interesting Wetherspoons, and popular. As I arrived a hen's party tottered out of a mini bus, all tight skirts & super high heels. I predicted tears before bed time as most were staggering & all were shouting. Luckily the pub absorbed them visually & aurally. I had a body contact pint of Doom Bar (2.55), necked it & ran away. I returned to the pub next morning for breakfast & enjoyed the silence.